Chichén Itzá on the Yucatán peninsula in Mexico was a large pre-Columbian Mayan city. The collection of remaining buildings is a UNESCO World Heritage site. 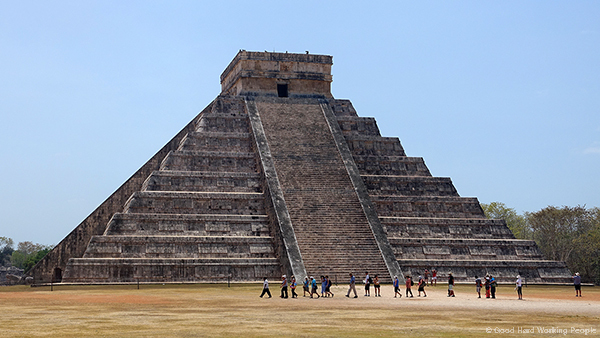 And the large pyramid El Castillo has been declared one of the New 7 Wonders of the World in 2007. While in Mexico last week, we took a road trip from Tulum halfway across the Yucatan to gaze at the wonder of Chichén Itzá and roam the 5 square kilometer site. This week, for the 5-year anniversary of the Moving Postcard web series, I thought a World Wonder would be just the right subject to celebrate. Yes, I do think it’s a bit of a wonder that for five years, since May 7th 2010, I’ve shot, edited and published a new 1-minute video every week and that some of you are still watching. I love you, guys and gals! Filming Chichén Itzá had a few small challenges: As apparently with all Mayan ruins, tripods were not allowed. In the first shot of the video, you can see a lady with a big dark umbrella walk towards me and prohibit me to use my tripod. An unfair fact: these utterly ridiculous selfie sticks are allowed – even if they are actually monopods and only pretend to be selfie sticks. Lesson learned. The other challenge was the overwhelming jungle heat, which kept us from seeing everything (instead we managed to squeeze in street tacos and snorkeling in Gran Cenote later that day). The guys making jaguar noises and yelling “cheapy, cheapy, cheapy” I wouldn’t truly consider a challenge – but they were certainly a bit taxing to someone I know. Perfect time to thank my husband Scott and all of my friends, again, who have willingly explored with me and patiently waited for me to get “just one more shot”. I love you all the most! In this video you’ll see images of El Castillo (the big pyramid, which has been partially restored) and its feathered serpent heads, Temple of the Jaguars and the Big Ball Court in the background of people jumping for a photograph (why exactly do people do that in front of famous sights? ), Plataforma de Venus, Templo de los Guerreros (Temple of the Warriors) with a statue of Chac Mool at the top and each column representing a different warrior, the snake heads of the Osario Temple, the Las Monjas complex with the Iglesia and finally El Caracol (The Snail), which was the observatory. No video from the Yucatan Peninsula is complete without at least one image of an iguana. Did you see it? There were a few things, I didn’t get to see, like the wall of skulls, but quite a few other sights I captured that couldn’t fit into this short video. I’ll either release a second longer version soon or at least post a lot more pictures on my personal blog soon. It gives me extra pleasure that for the 5-year-anniversary video, I was able to use a song by my old friend and talented musician Jason Matherne again. He has been on this journey with me almost from the very beginning. The song is called “Pegasus” – and I’ve probably used it a few times already. Jason, gimme me some more tunes, please!